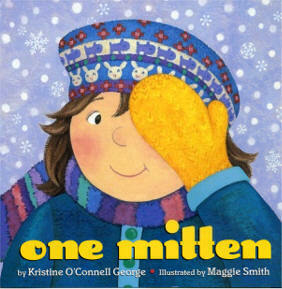 ONE MITTEN by Kristine O'Connell George | Spark your child's imagination! Copies available in your local library or, check below. What can you do with just one mitten? Use your imagination! 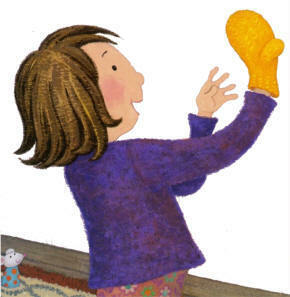 This bright, playful book celebrates a child's joyful discoveries of the many things she can do with a single mitten. Once again, the creators of Book! show that even the simplest things can be a springboard to creativity and reveal the fun that's hidden in ordinary things. The idea for One Mitten arrived one New Year’s Day while I was shivering on a street corner, watching the Rose Parade in Pasadena, California. Even though this was “sunny California,” it was really cold, and we were bundled up in coats and hats. While I was ooohing and aaahing over the floats, I noticed a toddler holding a mitten someone had dropped. To this Southern California kid, the mitten was clearly a puzzling novelty: What was it? What did it do? That's when I started thinking of all the things one could do with a single mitten. When I got home, I wrote the first (of many!) drafts for ONE MITTEN. Maggie Smith and I hope you enjoy ONE MITTEN. 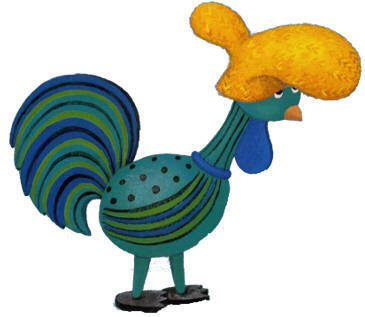 We invite readers of all ages to think of their own unique uses for a single mitten! Download The One Mitten Imagination Challenge Students from across the country read ONE MITTEN, then shared what they would do with only ONE mitten. 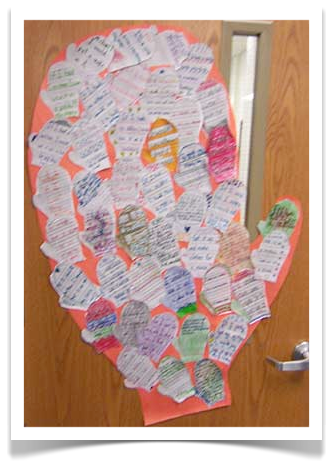 I was delighted to discover these amazing and creative resources on the web for mitten-themed curriculum. Check out these sites for ideas for math, science, art activities and more!